(by Peter Valdes-Dapena, CNN Money) – When an enemy is looking for you, especially an enemy with night vision technology, you want to keep cool and quiet. That’s why General Motors and the United States Army developed the hydrogen-powered Chevrolet ZH2 off-road truck. The 6½-foot tall ZH2 doesn’t burn hydrogen. Instead, it pumps hydrogen into a fuel cell where it’s combined with oxygen. That creates water (H2O) while, at same time, releasing a stream of electrical energy to power the vehicle. 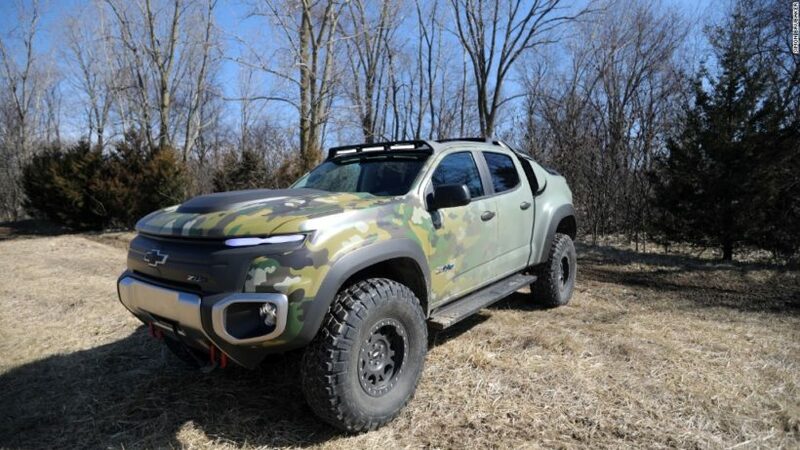 The truck was developed by GM in cooperation with the United States Army’s Tank Automotive Research and Development Center (TARDEC), headquartered near Detroit. 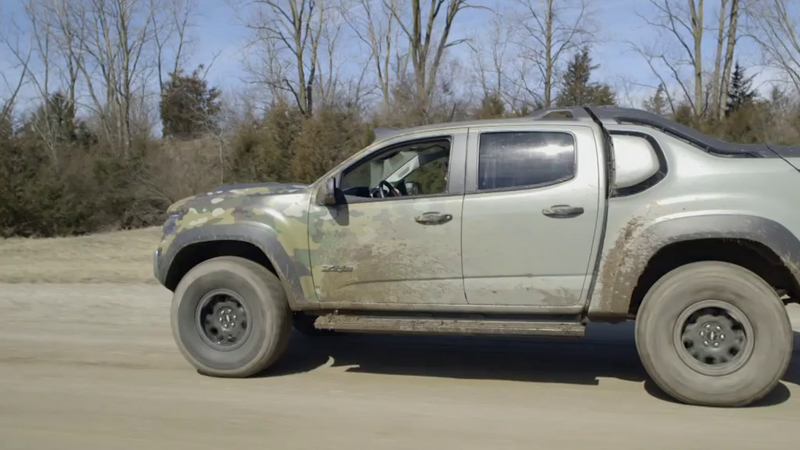 Underneath its camouflaged Kevlar-reinforced carbon fiber skin, the ZH2 is based on the GM’s Chevrolet Colorado mid-sized pickup. Since the truck isn’t burning any fuel, it doesn’t give off much heat that could be picked up by heat-sensing night vision cameras. In other words, there’s not much of a “thermal signature” either. Refueling the truck will be different from refueling a truck with liquid fuel. The ZH2’s thick-walled storage tank — GM engineers went through 38 saw blades trying to cut one in half for a display — is filled with compressed hydrogen gas. Although hydrogen is the most abundant element in the universe, it doesn’t ordinarily exist as a free-floating gas. It has to be extracted from substances that contain hydrogen, like water or hydrocarbon fuels. That can be done using portable devices that can run on solar or battery power or that plug in to a local electrical grid. “Our machine will take JP8, which is the common military fuel, and convert it right into hydrogen,” said Butrico. Where ever it goes, it can make its own fuel. Hydrogen gas could also be made from any sources on hand wherever the truck happens to be, he said. It takes about 3 minutes to fill the fuel tank, according to GM. With five to six kilograms of hydrogen — about 12 pounds — the ZH2 can go about 200 to 300 miles, said Charlie Freese, executive director for GM’s fuel cell business. It could go as far as 400 miles with a hydrogen tank optimized for longer range, he explained. Prior to creating the ZH2, GM and the military had been experimenting with hydrogen fuel cells in strictly road-going crossover SUVs. Today, Toyota, Honda and Hyundai have fuel cell vehicles available for lease or sale to the general public in California. First published April 3, 2017. Reprinted here for educational purposes only. May not be reproduced on other websites without permission from CNN Money. For the original article, visit the CNN Money website. 1. Who developed the U.S. army’s new ZH2 off-road truck? 2. How is the ZH2 powered? 3. Describe the two features that make it a stealth vehicle. 4. How is the truck refueled? 5. Watch the video under “Resources” below. What is our reaction to this latest military vehicle?